Our modern high pressure car wash is always available during opening hours Monday – Saturday 8am to 7pm. 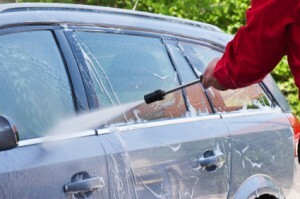 The car wash is self service or attended by one of our attendants when available. The wash programme comprises of a rinse first to remove heavy soiling and to wet the vehicle. The next stage is the main wash with the detergents and wax which removes any remaining soiling. The incorporated wax is applied during the main wash cycle too. The final stage is the high pressure rinse which removes any lather and any remaining dirt particles. Once dry you car will look great and will have a wax coat which will repel traffic film and moisture ensuring a lasting shine.